If there's one holiday that lends itself particularly well to DIY projects, it's Halloween. Between sewing costumes, carving pumpkins, and mixing punch bowls, it's no question that All Hallows' Eve is every DIY-er's favorite fête. And while we might not all be particularly handy, there is a DIY Halloween décor project out there that exists for every skill level. The only requirement, as far as we're concerned, is that it looks chic. To celebrate Halloween in style, we turned to our favorite Pinterest accounts for some easy and elevated DIY projects that would blend in beautifully in any home. Since Pinterest is flooded with do-it-yourself ideas, we did the heavy digging for you and selected our favorite festive projects from the social media site to help you spookify your space. Whether you're throwing a scary dinner party, a children's fête, or simply decorating your front porch, we've got the perfect project for you. Craft a stylish atmosphere with these stunning DIY Halloween décor projects—your beautiful haunted house awaits. Channel your inner Jackson Pollock, and give your pumpkins a splatter treatment with this DIY Halloween décor project. The result is chic and minimal—perfect for ones who aren't fans of orange. What You'll Need: Craft pumpkins, spray paint, paint brush, acrylic paint, and kraft paper. Invite your guests in style—The House That Lars Built created these downloadable Halloween party invitations. Simply fill in your details and print! What You'll Need: Access to a printer and off-white card stock. Short on time but still want your Halloween décor to be on point? We have the perfect five-minute DIY for you. Simply place crayons on top of your pumpkin, blow dry it for a few minutes, and voilà! Want to give your fall florals a spooky touch? 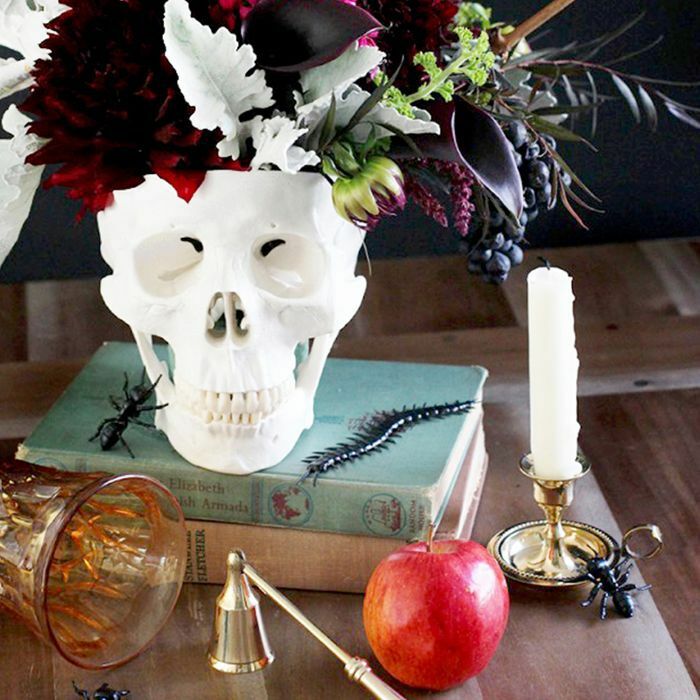 Arrange them in a skull vase, and use it as a centerpiece for your Halloween dinner party. What You'll Need: A life-size model skull with removable calvarium, wet floral foam block, pruning shears, knife, large Ziploc bag, and fresh flowers. We love this trendy take on DIY Halloween décor. If mud cloth is already in your home in pillow form, why not take it a step further and repeat the pattern on your pumpkins for Halloween? We love no-carve pumpkin decorating ideas that are so simple it hurts. This is one of them. Simply grab a collection of mini pumpkins and a bag of balloons and wrap away. What You'll Need: Balloons, scissors, and mini pumpkins. Kids will love these adorable mini ghost piñatas. Fill them up with their favorite candy, and hang them as decoration until Halloween night. What You'll Need: Paper lantern, crêpe paper, double-sided tape, regular sticky tape, white paper, scissors, and candy. A great pumpkin carving DIY for minimalists—instead of carving faces, why not simply make polka-dot lanterns? They will glow and cast the most flattering light. What You'll Need: Pumpkins, serrated knives, metal spoons, drill, masking tape, and pipe cleaners. For a whimsical take on Halloween, create these adorable baby pumpkins. Complete with faces and "antlers" they will melt your guests' hearts. What You'll Need: Mini Pumpkins, sharpie, drill, and eucalyptus branches. If you celebrate, opt for décor inspired by Día de Los Muertos (or Day of the Dead). This festive statement wall also doubles as a makeshift photo booth to take your celebration to the next level. What You'll Need: Latex balloons in a variety of colors, balloon hand pump, and gaffer's tape. Keep it simple with this no-carve pumpkin DIY. Paint pumpkins a solid color, and then add brushstroke accents in a contrasting (yet complementary) shade. What You'll Need: Pumpkins, paint in various colors, and paintbrushes. Bring a sense of humor to your Halloween bash with these silly ghost balloons. They'll haunt your guests in the best possible way. What You'll Need: Helium-filled balloons, permanent marker, and tissue paper. This DIY would make a great Halloween party activity. Provide a variety of paints, paint pens, and mini pumpkins, and let your guests decorate their own party favor. It's a win-win. What You'll Need: Mini pumpkins, paint, and paint pens. If you're a fan of the cult-classic Hocus Pocus, this banner was basically made for your Halloween party. And the best part? It couldn't be easier to make. What You'll Need: Cardstock, baker's twine, scissors, and access to a printer. Rather than carving pumpkins, embrace your punny side with this DIY Halloween décor project that's been shared over 74,0000 times on Pinterest. What You'll Need: Pumpkins, paint in various shades, and temporary tattoo transfer paper. This story was originally published on October 19, 2016, and has since been updated.